Now we come to the second reason why we chose to stop for a few days at Réalmont. The first was Albi, about 20kms/12mls to the north. The second is Castres, lying a similar distance to the south. The weather has been a little unsettled since we arrived but today, Saturday, looked more promising and it’s market day in Castres. Following a now familiar pattern, Castres is known for two things. Hoorah! I confess that’s a personal opinion rather than something I read somewhere. 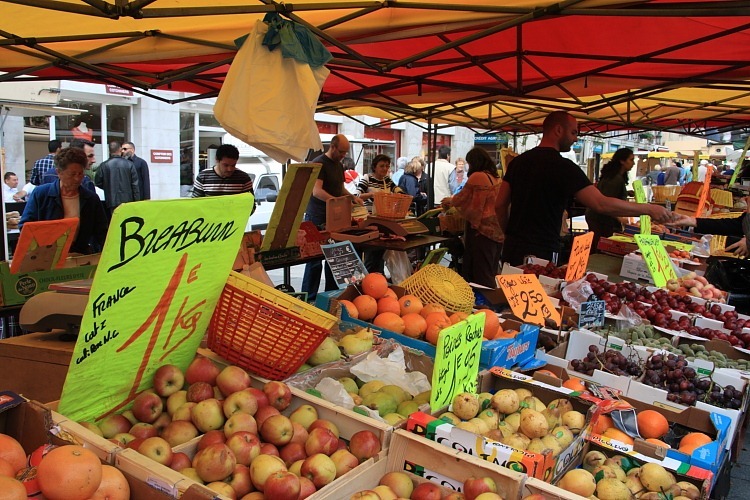 The first and the reason we were happy to visit Castres on a Saturday morning, is its market. 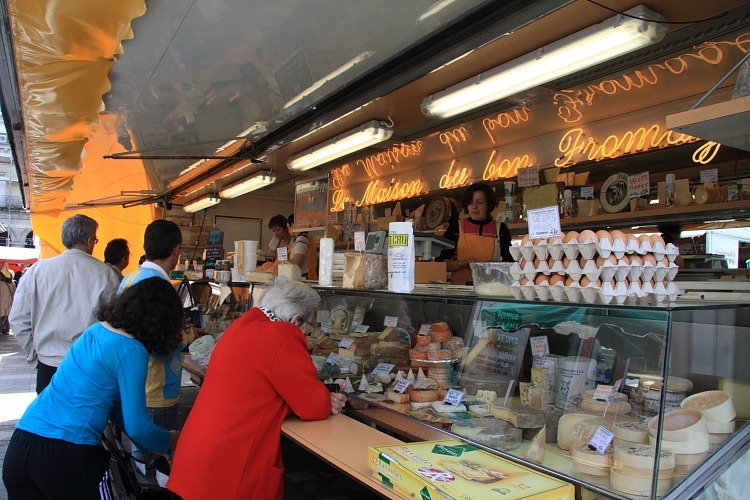 We’ve been relatively impoverished thus far, market-wise, and it was good to get a second dose of France’s wonderful street market culture. A little sun, some colourful market stall umbrellas and some colourful locals are a good start point but markets are notoriously difficult to photograph. All too often, the picture is full of shoppers rather than of the market itself. We quite like these two, especially the lady leaning on the cheese stall counter seemingly staring longingly at the wares. As a confirmed cheese-aholic, I know exactly how she might feel. 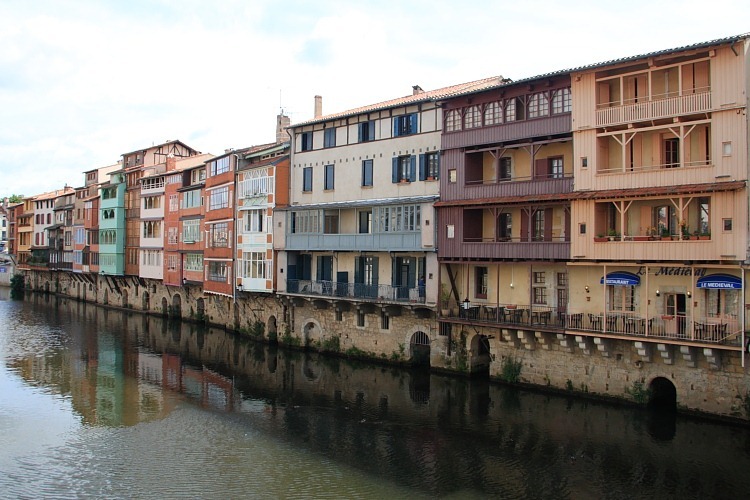 The other notable part of Castres, as depicted on many postcards, is a rather colourful stretch of buildings fronting the river Agout which flows through the centre. Clearly the tourist office didn’t plan Castres very well since, to get the best out of it, you need to visit in the morning for the market but later in the afternoon to get the sun on the buildings, which face north-west. We didn’t. Still, albeit contre-jour, here’s a shot to give you the idea. Between Réalmont and Castres lies the old village of Lautrec, presumably the one of Henri Marie Raymond de Toulouse-Lautrec-Monfa fame. 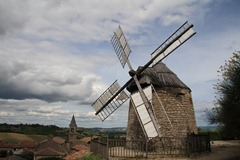 Breaking with tradition, Lautrec appears to be known largely for an intriguing windmill. The fascinating feature of this, IMHO, is the way in which the sails are adjusted according to the wind strength. Each sail has two sheets of material supported on wooden vanes. The sheets seem to be manually twisted to reduce the surface area, then tied off onto the vanes when the miller judges that he’s got it right. Simples! !